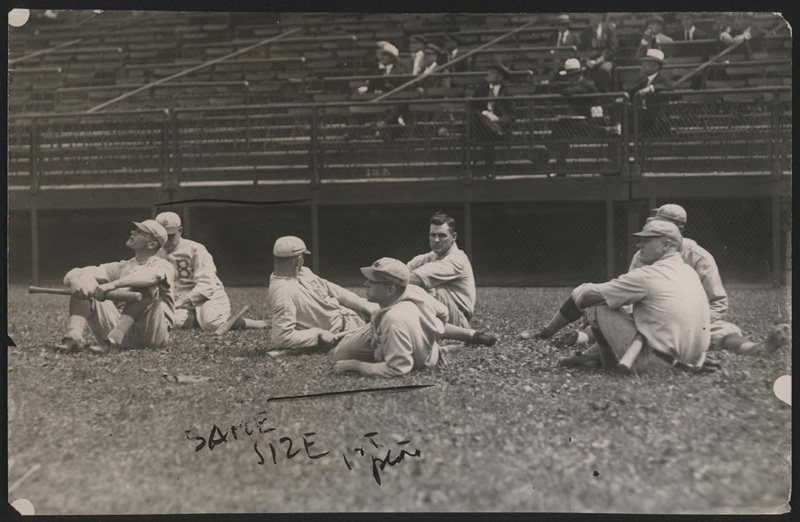 There's nothing like spending the afternoon sitting on the grass at your favorite ballpark. 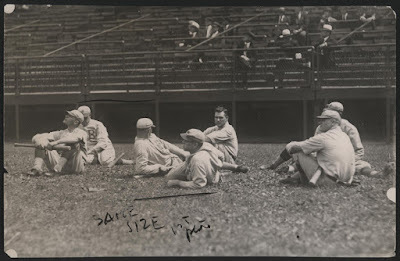 Featured above is a vintage 1919 NEA press photo (ebay link) of several Brooklyn Dodger players relaxing before a game. It is date stamped August 27th, but likely comes from the prior day when they played a twin-bill against the Cardinals. I have no idea who is in the photo, but I figure Zach Wheat has got to be hiding there somewhere. This Day in Dodgers History: In 1946 the second game of a doubleheader between the Dodgers and Cubs at Ebbets Field is postponed during the fifth inning due to a giant swarm of gnats attacking the field and players. In 1978 the home attendance at Dodger Stadium of 47,188 fans marks the first time in Major League history that a team has drawn more the three million rooters at home. Happy Birthday, Doc Bushong, Bud Clancy, Fritz Ostermueller, Charley Smith & Jim Barbieri! This coming Saturday, September 16th, the Los Angeles Dodgers Foundation (LADF) will host its first Dodgers Dreamfield Community Service Day at Bud Bender Park (235 N. Lilac Avenue) in Rialto. Festivities begin at 10:00 AM with opening remarks and a youth clinic for kids in the local Rialto Pony League, North Rialto Little League, Rialto Eastern Little League, and the Bill Batts Rialto Girls Softball League. Dodger Alumni Tommy Davis, Mickey Hatcher, Kenny Landreaux, Matt Luke and Derrel Thomas will lead the clinic and participate in a community garden project. Awesome! Chase Utley joined Mike Oz of Big League Stew to open up a pack of 25-year old Baseball cards. Check it out here. I love these videos! Per Travis Sawchik at FanGraphs; "Finding More Work for the Dodgers’ Other Great Catcher." Entering play Thursday, Barnes had made 99 plate appearances in the second half of the season and produced a .309/.434/.383 slash line. What’s also notable is that Barnes has a 15.2 % walk rate in the second half and a 11.1% strikeout rate. Grandal has had 161 second-half plate appearances and has slumped, batting .207. In the first half, Barnes recorded 126 plate appearances and Grandal made 280. Via Joe Trezza at MLB.com; "Behind Taylor's rise: a new, dynamic swing: Dodgers' unsung hero overhauled his approach in offseason, and it's paying dividends." Taylor spent his nights watching the postseason he was not a part of. He spent his days creating a new swing for himself to replace the one that had, to that point, produced just one home run in 318 career plate appearances. Under the watch of club hitting consultants Craig Wallenbrock and Robert Van Scoyoc, Taylor sought to do what more hitters are doing now than ever before: make their swing more dynamic by making it more complicated. "I kinda went to the extreme right away and had some pretty big moves," Taylor said. "I've started to realize a lot of guys are having success with bigger moves. As long as you modify them." Blowout Buzz gives us an early look at Panini's 2017 National Treasures Baseball card set slated to be released on October 25th. 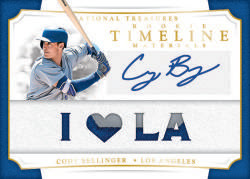 It includes the below Cody Bellinger auto'd relic card. Go here to check out more preview pics.